1880-1881 which reveals at that time this badge was worn by George Strong, Sergeant of the South Side Station. Source: History of Milwaukee, Wis., The Western Historical Society, Milwaukee Policemen. Research continues for earlier records. The Milwaukee police department was born October 4, 1855 with a Chief, William Beck, and six policemen. By 1860 the department added two Sergeants, one for the South Side and another for the North Side. 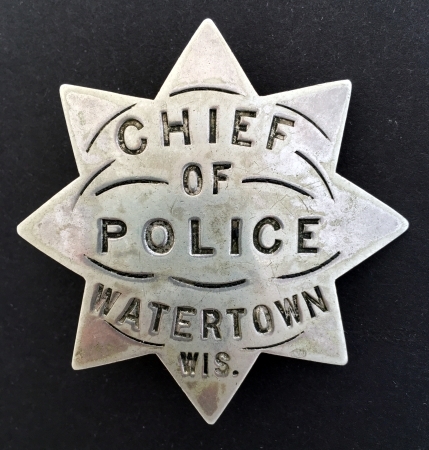 Wausau Wisconsin Police badge circa 1900-1920. The Wausau PD was founded in 1900 according to our friend Fred Borgmann. Housing Authority Watchman #37 City of Milwaukee Wisconsin badge circa 1930. Milwaukee Police 1st issue badge #362, circa 1881. Hallmarked by N. W. Stamp Works Milwaukee and Chicago. In 1881, Andrew Schwaab founded the Northwestern Stamp Company in Milwaukee and added two branches one in St. Paul where his brother George was manager and one in Chicago with brother Theodore managing.